Former racing motorcyclist and noted tuner Giuseppe Gilera decided to create his own marque in 1909. It was a significant year for Italian motorcyclists, who saw an improvement in their speed regulations – 9 mph in town, and 25 mph by day and 12.5 mph by night outside city limits. The way was open for the growth of the industry – at that time, there were only 4000 motorcycles in Italy, against more than 27,000 registered in neighboring France. 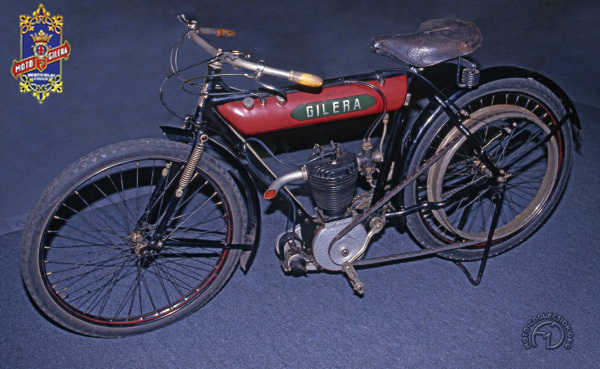 Born in 1887 near Milan, Gilera was only 21 when he designed his first machine. It was a thoroughly conventional model, with a modest (317cc) displacement and the apparent simplicity of a big powered bicycle. Indeed, at the factory, this first model was familiarly known as "Ia bicicletta." However, thanks to Gilera's overhead-valve engine, the Type VT was remarkably rapid. It could reach a top speed of more than 62 mph, and the generous (for the period) finning of the cylinder and head gave it a note of originality. So this apparently modest little bike was quite a sportster, which Giuseppe Gilera proved in 1912 by winning the 114-mile Circuit of Cremona at an average of over 41 mph. Production of the 317 VT ended in 1912. It was replaced by 3.5 and 5 hp twins, whose very existence is only proved by mentions in the motorcycling press of the day, for nothing else survives – not one bike, not even a photograph. The 317 VT brought Gilera its first competition successes. This immaculately restored bike is a star exhibit in the company's museum at Arcore.